Advice needed... I'm sure mine is an all too familiar tale!!! @BeHappy Thanks again for your detailed responses; they are quite helpful! Yes, next step for me would be to reach out to a few doctors. I wanted to solicit some informal views from the knowledgeable gents on this forum so that I can compare with the doctors’ inputs. I will research doctors primarily based in South East Asia for now given I’m based in Singapore. But in order to get the best results, I’m open to traveling further away as well. I will report back on this thread with what I hear from the doctors. Thanks! @BeHappy Many thanks for your reply. I have a few questions: 1. Why did you choose to get the beard and chest grafts done over several sessions as opposed to one or two big sessions? Were you keen to try see some results first before committing to more extractions from your donor area? 2. How well has your beard donor area healed? My research seems to indicate that even FUE scars at the back of the head are noticeable to an extent where you can't completely shave down. Doesn't this apply to the beard donor area as well? Or is the extraction process different? 3. For someone like me, who already has a FUT scar, would you recommend that any further hair transplants also utilise the FUT? The reason I ask this is because I understand that FUT yields more grafts. Moreover, choosing FUE in order to wear the hair shorter is not an option for me because of my existing scar. Am I thinking on the right lines here? Thanks again! Hey guys, First of all, kudos for running an awesome, informative and helpful forum!!! I'm a 37 year old south asian guy currently living in Singapore. My hair started thinning around the age of 19-20 and progressively got worse in my early 20s. I have a family history of hair loss from my dad's side. My dad, uncles and grandad all lost their hair in their early 20s with fairly advanced balding. As a reaction to my initial thinning of hair, I impulsively opted for a HT in 2008. I'm afraid I can't provide details about the HT except that it was an FUT. Ten years on, my hair loss continued to a point where the HT became quite ineffective, as can be seen from my pictures. If I could do it all over again, I would've skipped the HT and lived with a completely shaved head. But here we are... 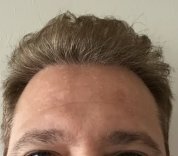 So given my current state of hair loss, I'm looking for advice on whether there's any point in pursuing further surgical options. If there was an option to cover my FUT scar to an extent where I can shave my head completely, I would definitely go for that. But my research shows that there is no sure shot way to do this (SMP, etc.). Happy to be corrected here. Given my current state, would another HT improve my look significantly? I'm realistic about possible outcomes and know that I will never have a full head of hair. But I would be keen to explore ways to 'improve' my current look. Any advice will be much appreciated. Thanks!